If you are like me, Christmas is a time for a little overindulging; mince pies, cake, Christmas dinners and wine. I am not a big drinker but I do like to have a glass or two, at Christmas this might become three or four. Well, there’s no harm in that you may say, and you’re probably right; but, having ran an addiction charity for over ten years I am always conscious, at the back of my mind that alcohol is still a habit forming drug, and that to some in our community this habit can become very costly. This is one of the reasons why for the last few years, I have been going dry for January. Alcohol addiction is one of the most subtle there is. A large number of British people drink, it’s socially accepted, readily available and quite enjoyable, but this is the exact reason why we can’t be complacent with our drinking. You see, it is very difficult to know when that social drinking, moves into risky or harmful drinking, or when an enjoyable few drinks with friends has become a habit and then worse, a full on physical addiction. So how does social drinking become a problem? Well, it may begin with enjoying a few drinks to unwind, but then you find you can’t unwind without a few drinks, or you begin to feel you need alcohol to distress or cope with difficult situations. You become tense or depressed when you haven’t had a drink or when you drink, you find it hard to stop, sometimes putting yourself in vulnerable situations when under the influence. Is this sounding familiar? If you are worried about your drinking, other questions to ask yourself are, have you begun to lie or feel ashamed about your drinking, is it affecting your relationships, do you regularly drink more than you intended? Agreeing with some or all of these could be a sign there’s something wrong. Many people think it is only when you need a drink on a morning, or feel a physical dependence that alcohol has become a problem, but these are usually the latest stages of alcoholism and by that point things have usually become much harder to bring back under control. This is why dry January is great. There’s nothing better than a month sober to get on top of habit forming behaviours or highlight any possible problems. It is also really good for you. Dry January participants often report losing weight, sleeping better, having more energy or clearer skin plus financially they have more in their pocket (Which is always welcome after Christmas). Many people get sponsored for dry January too, raising funds for Alcohol Concern, the national charity dedicated to tackling the harm caused by alcohol to individuals, families and society. Most importantly it shows how life without alcohol is possible. So why not join me in the challenge? 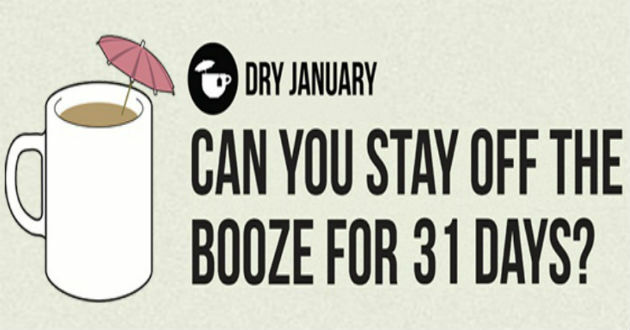 For more information see http://www.dryjanuary.org.uk. It could be the best thing you ever do!